A long running debate in the marketing literature has focused on whether firm performance is driven primarily by competitive intensity or firm characteristics. 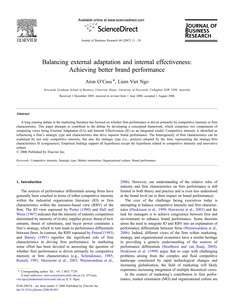 This paper attempts to contribute to the debate by developing a conceptual framework, which comprises two components of competing views being External Adaptation (EA) and Internal Effectiveness (IE) as an integrated model. Competitive intensity is identified as influencing a firm's strategic type and characteristics that drive superior brand performance. The heterogeneity of firm characteristics can be explained by not only competitive intensity, but also the strategic type (i.e., posture) adopted by the firm, representing the strategy-firm characteristics fit (congruence). Empirical findings support all hypotheses except the hypothesis related to competitive intensity and innovative culture.